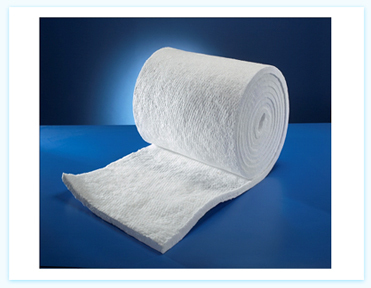 Ceramic Fiber Blanket is a needled blanket made from our ceramic Fiber. The blanket is Lightweight, Flexible and available in a wide variety of thicknesses, widths and densities. Ceramic Blanket resists temperature as high as 2300` F.
This material is lightweight and has very low thermal conductivity, excellent handling strength, low heat storage, thermal shock resistance and corrosion resistance (commonly used acid and alkali). It also provides excellent sound absorption and excellent fire protection. Thickness : 1/4", 1/2", 1", 1-1/2", 2"
Width : 24" and 48"
Repair, insulation and linings for furnaces, kilns, generators, reformers, boilers, etc. High-temperature pipe insulation, casting mold insulation, etc.